Cristina Moroño is an artist in pursuit of constant experimentation. 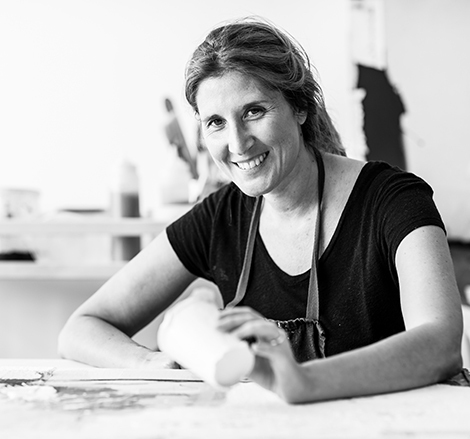 Merging different practices, including photography, etching, engraving, collage and paper making, Cristina oscillates between the figurative and the abstract in her search to capture the passing of time and the ephemeral nature of our lives. Cristina majored in printmaking, graduating with honours at the Universidad Complutense in Madrid, where she also obtained a Master Degree in Fine Arts. In 2003 she moved to New York and in 2016 she relocated to Hong Kong where she currently lives and works. She has received several prestigious awards, most notably from the San Fernando Royal Academy of Fine Arts in Madrid, a fellowship from the Joan Miro Foundation, the DeArte Foundation’s prize "Hotel Puerta America" and the ESTAMPA Art Fair and “Asociacion de Criticos Madrileño”s, Madrid, Spain: “Best Artist of the Year ESTAMPA 2007”. Her work is held by public and private collections including the National Library and the City Museum in Madrid, the FRIDE Foundation, the Joan Miró Foundation, the Gorbachev Foundation of North America and the Macy’s Art Collection in New York. Her work has been exhibited extensively throughout Europe and New York, with her first exhibition in Hong Kong with Puerta Roja in 2016.
International Center of Photography, New York, USA; Certificate in General Studies. Complutense University, Madrid, Spain, Master In Fine Arts –MFA in Printmaking and Drawing. Complutense University, Madrid, Spain: Bachelor Degree in Fine Arts; Printmaking. School of Visual Arts, New York, NY, summer residency program in Photography. Joan MIRO Foundation, Palma de Mallorca, Spain, summer residency program in Graphic Arts. Ministry of Culture, Spain; Fellowship in Curatorial Studies- Paradores Nacionales de España. 'Second Chance' Galeria BAT Alberto Cornejo, Madrid, España. 'Second Chance' Puerta Roja Gallery, Hong Kong. Rodrigo Juarranz Art Gallery, Burgos-Madrid, España. Moret Art Espacio La Coruña, España. Collectors Cabinet. Puerta Roja Gallery, Hong Kong. Feria de Arte ESTAMPA 2016, Matadero-Madrid, Madrid. España. Jane Hartsook Gallery at Greenwich House Pottery, Annual Members Exhibition. First Competition of Graphic Works Organized by the Foundation FRIDE and Complutense University Casa de América, Madrid, Spain. Certamen de Arte Grafico para Jóvenes Creadores 1999, Litografía, Serigrafía, Técnicas digitales y electrográficas. Calcografía Nacional, Real Academia de Bellas Artes de San Fernando, Madrid, 1999, Pg. 27. Certamen de Arte Grafico para Jóvenes Creadores 1999, Litografía, Serigrafía, Técnicas digitales y electrográficas. Calcografía Nacional, Real Academia de Bellas Artes de San Fernando, Madrid, 2000, Pg. 57. Premio de Grabado Contemporáneo 1996-2000. Dirección General de la Mujer, Comunidad de Madrid, 2000, Pg. 49. III Trienal de Arte Grafico 2002. La Estampa Contemporánea. Calcografía Nacional, Real Academia de Bellas Artes de San Fernando, Cajastur, Oviedo, 2002, Pg. 183.